Have your next “Best Party Ever” at BAM! 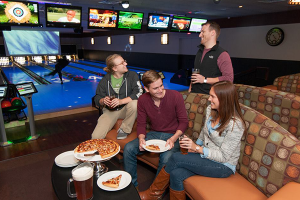 With bowling, laser tag, mini-bowling, high ropes course and a huge arcade, there is something for kids of all ages. We serve hand-crafted, local micro brews and domestic beer and wine. We have some of the best bartenders in Holland serving signature cocktails. Our "Something for Everyone" menu makes BAM! your one-stop, non-stop party place. Parties are available by reservation only. A $100 non-refundable deposit is due at the time of booking a "Friends" or "Friends and Family" Party. A $200 non-refundable deposit is due at the time of booking an "Everyone You Know" party. You can also give us a call at 616-392-7086.